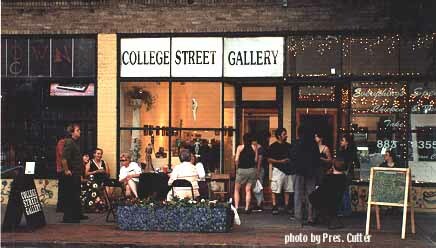 The College Street Gallery was established in October 1997 by Michael Mulley. Since then the gallery has given local artists an easily accessible venue to display their work. Established artists such as Frederick Seaton, Peter Fowler, Mary Begley and Carrieanne Hendrickson and many others have been featured at the gallery as well as many first time exhibitors. In November 2008 the gallery became home to the COLLEGE STREET GALLERY CO-OP. The Co-op feature 15-20 artists each month displaying work in all mediums. The gallery has a permanent collection of Architectural Photography by Michael Mulley from City Hall to Freddies Doughnuts the whole city is represented, custom framing and photography services are always available. If you are looking for a special gift for someone keep us in mind. The College Street Gallery is located at 244 Allen Street, near the corner of College in the historic Allentown neighborhood of Buffalo, NY. Hours: Wed- Sat 5-8 pm and by appointment. There is always an exhibit on display at the gallery, opening receptions for new shows are held on THE FIRST FRIDAY of each month they are free and open to the public. Michael Mulley is the owner of the College Street Gallery, an art gallery open in 1997 in the Allentown district of Buffalo, New york. Mike is a freelance photographer who earned a BFA from the Rochester Institute of Technology in 1991. His earliest work was largely in the area of photographing performing musicians in the realms of rock, jazz and blues. He also photographs architecture and urban street scenes in Buffalo, around the U.S. and around the world. In addition, he photographs nature scenes, and anything else that captures his imagination. Mike was the publisher of ANGST,(1992-1999) a 'zine which appeared occasionally and covered rock, rap, politics and the arts. His photos have been published in the Buffalo News Sunday Magazine, Buffalo Spree Magazine, Artvoice, Metal Maniacs, and the jazz magazine Coda. In 2006 he was commissioned by the Allentown Association to document the 1200 properties that make up Buffalo's largest historic preservation district. In 2007 he opened Queen City Gallery in the Historic Market Arcade (617 Main Street) in the heart of Buffalo's theater district. The gallery features his photographs of Buffalo architecture as well as exhibiting local and regional artists. He was also the organizer / curator in conjunction with the J.W. Bush Gallery in Hamilton of the first Buffalo- Hamilton Artist Exchange which saw nearly a dozen artists from each city to exhibit their work. selection of art, organizing group exhibitions and community events. See some of Mike's photos of Buffalo here. See more of Mike's portfolio click here.